Former Prime Minister Tony Blair has been questioned for a third time by detectives investigating allegations of "cash-for-honours", it has emerged. Mr Blair, who left Downing Street on Wednesday, had already become the first PM to be interviewed by police in the course of a corruption inquiry. Prosecutors had asked Scotland Yard to carry out further inquiries before deciding if charges should be brought. Those questioned so far, including two of Mr Blair's aides, deny wrongdoing. A spokesman at Scotland Yard said the Metropolitan Police was "not prepared to discuss" the inquiry, which has already seen at least 136 people being interviewed. And a spokesman for Mr Blair refused to confirm or deny the latest development. On Tuesday morning the then prime minister's official spokesman was asked by BBC News website if there had been any further contact between the police and the prime minister and he replied his previous answers "had not changed". According to the Evening Standard newspaper, however, the prime minister had been interviewed for the third time about three weeks previously. The second time Mr Blair was interviewed, the spokesman explained he had not told journalists because he had not been informed himself. Earlier this month, No 10 fundraiser Lord Levy and Ruth Turner, who worked in Downing Street, were re-bailed by police. Both of them had been arrested and questioned as part of a year-long investigation which was, at first, checking if honours had been "sold". This was because after secret loans were made to Labour ahead of the 2005 general election, it emerged that some lenders had gone on to be nominated for peerages. However, it was then widened to look into any attempt to cover up certain activities, and also went on to cover the other main parties. 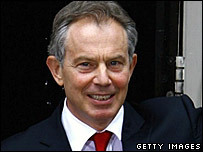 Mr Blair was then questioned twice as a potential witness. There have been two other arrests during the inquiry, with Labour donor Sir Christopher Evans re-bailed earlier this month, and head teacher Des Smith informed that he would not be charged. No-one has been charged with any offences and have all consistently denied any wrongdoing.